Looking for a Used LaFerrari in your area? CarGurus has 8 nationwide LaFerrari listings and the tools to find you a great deal. Introduced in 2014 for the 2015 model year, the Ferrari LaFerrari eclipses everything currently or previously offered in the Italian automaker's lineup of high-end performance cars. That's saying a lot, and the limited-edition LaFerrari delivers on all cylinders, thanks in part to its hybrid powerplant, a first for Ferrari. The LaFerrari trumps not only such highly praised Prancing Horse stablemates as the Enzo, which it replaces, and the F12 Berlinetta, but also outguns just about everything else on the road today. Only a few competitors in its rarefied class of eco-configured hybrid supercars, like the Porsche 918 Spyder and the McLaren P1, can manage to keep pace. Ferrari plans to offer only 499 examples of the LaFerrari, ensuring its exclusive nature until the Next Big Thing arrives. At the moment, however, the LaFerrari takes honors as the automaker's Current Big Thing. With its swooping, futuristic lines and stratospheric power/performance numbers, the LaFerrari brings together all the automaker's cutting-edge technical and design expertise in one ultra-high-end sports car. Even its repetitive name (literally "the Ferrari the Ferrari") is intended to signify the car's top-of-the-heap uniqueness, though some in the auto industry criticize the name for being unimaginative, meaningless, or even silly. There's not much else they can criticize about the car, however. Test drivers typically pile on the superlatives when describing their experiences with the LaFerrari. Behind the squarish, flat-bottomed racing wheel, firmly planted in the race-inspired driver's seat in front of the high-tech dashboard, drivers can push the LaFerrari hard and rarely reach its limits, especially with the electronic stability control system (ESC) in the off position. The supercar's low center of gravity, wide Pirelli tires, and aerodynamic shape, which emphasizes downforce in all the right places, keep it firmly planted to the ground, and tight steering ensures pinpoint accuracy, maneuverability, and drivability at high speeds, which top out at 221 mph. Termed a "mild hybrid" and featuring a midengine design, the LaFerrari gets a good portion of its potent juice from a 6.3-liter naturally aspirated V12 engine, dubbed the F140 FE, which it shares with the F12 Berlinetta. Rejiggered for the LaFerrari, the big engine pumps out 789 hp and 516 lb-ft of torque, compared to the F12's 740 hp and 509 lb-ft of torque. In addition, Ferrari pushes the V12's redline from 8,700 rpm in the F12 to 9,250 rpm in the LaFerrari. But the power/performance numbers don't stop there. Ferrari augments the gas engine with a 120-kilowatt electric motor, which adds 161 hp and 117 lb-ft of torque. Performance numbers for the hybrid powerplant top out at an eye-popping 950 hp and 633 lb-ft of torque. 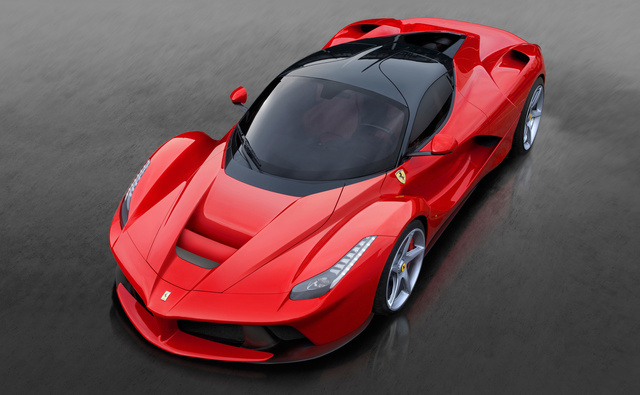 Lightning-fast acceleration reflects those numbers, with the LaFerrari jumping out from 0-60 in about 2.5 seconds. Ferrari calls its hybrid powertrain a HY-KERS (hybrid kinetic energy recovery system) unit. The electric motor provides short bursts at lower revs to improve torque and acceleration and reduce the need for the V12, which helps to conserve fuel. The electric motor sits at the back of a refashioned 7-speed Getrag dual-clutch gearbox, which does a good job of channeling all that power to the rear wheels. The hybrid package also includes a 132-pound lithium-ion battery pack, located at the back of the passenger compartment. The powerplant improves fuel economy by 40 percent when compared to the F12, according to Ferrari, but the numbers still don't astound, checking in at 12 mpg city/16.6 highway/14 combined. That compares to a top mileage number of 15.9 mpg for the F12 and 13.8 for the Lamborghini Aventador, so it does represent a slight improvement. Of course, no one buys this car for its fuel economy, and despite the LaFerrari's lofty pricetag, all the production vehicles have already been spoken for, attesting to its popularity with Ferrari aficionados. The car's impressive acceleration and speed have as much to do with its aerodynamics, exterior design, and light weight as with its powerplant. To create a car with maximum rigidity and minimal weight, Ferrari brought together a team of its best F1 and GT engineers. They built the LaFerrari on the same chassis as the Enzo, and despite the weight constraints added by the hybrid components, managed to reduce weight by 20 percent, to 2,767 pounds, while increasing rigidity by 27 percent. The extensive use of four different types of carbon fiber, as well as design solutions like attaching the seats directly to the chassis, helped the designers achieve their goals. The LaFerrari sits about 1.4 inches lower than the Enzo, and although it has the same wheelbase (104.3 inches) and overall length (185.1), its body is 1.6 inches narrower, which improves aerodynamics. The midengine design ensures a good overall balance, with a 41/59 percent front-to-rear ratio. In many ways, the LaFerrari operates like a rocket on wheels, but no rocket ever looked like this. It's a tight, highly sculpted, fiery red supercar, sure to turn heads wherever it goes. Its downward-sloping nose and low hood, as well as scooped-out doors, muscular wheel arches, and a streamlined cabin, ensure optimal airflow around the vehicle. Nice features like rear cooling intakes and extended side-view mirrors on long stalks provide unique visual cues. The upward-opening swan doors are made from two types of composite material to ensure their light weight, and they provide easy entry and exit as well as a high level of coolness. The wheel wells easily accommodate the big staggered-width tires (19 inches in the front, 20 in the back), as well as huge 15.7-inch carbon ceramic Brembo disc brakes in the front and 15-inch brakes in the back for optimal braking power. Inside, drivers will find plenty of legroom and headroom, despite the relatively narrow, tapered greenhouse. Ferrari offers seats in three sizes, and since they're fixed to the chassis, the pedals and steering wheel adjust, so the driver can find a comfortable operating position. The fixed seats also help the driver feel more a part of the car. In typical Ferrari fashion, the 2-passenger cabin emphasizes function over luxury, with a certain simplicity of design. Interior components are more inclined toward the driver for an F1 feel. A 12.3-inch dash screen, located right in front of the driver, displays all the important performance information, and various controls and knobs are within easy reach, though some reviewers say they're a little outdated. The LaFerrari comes equipped with all the latest tech and safety features, including electronic stability control, high-performance ABS, F1 electronic traction control integrated with the hybrid system (EF1-Trac), a third-generation electronic differential (E-Diff 3), and a magnetorheological damping system with twin solenoids (SCM-E Frs). The suspension includes double wishbones in the front and a multilink system in the rear. It all makes for a supercar package unlike anything Ferrari has offered before, making it one of the most coveted production cars currently available worldwide. What's your take on the 2015 Ferrari LaFerrari? Have you driven a 2015 Ferrari LaFerrari?